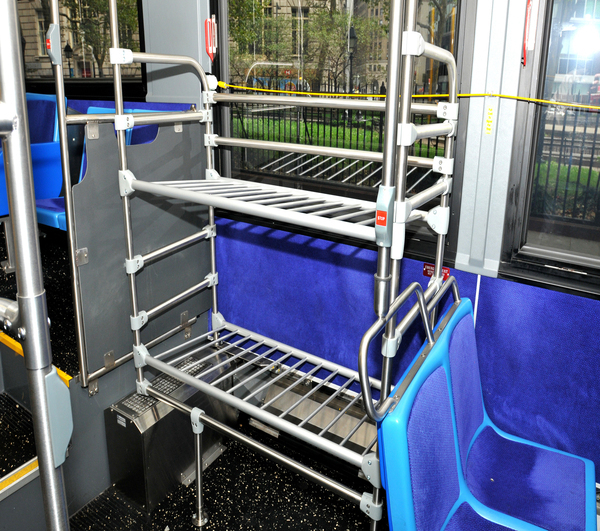 The new luggage racks that will be on 7 NYCT bus routes serving NYC airports. Focusing on the large number of customers who choose to take public transit to LaGuardia and Kennedy Airports, New York City Transit is beginning a pilot program to install luggage racks on some of the buses serving the airport routes. The new racks should make for a more comfortable ride for passengers carrying luggage onboard while providing more room for everyone. The first luggage rack-equipped bus was placed in service this morning on the M60 route, which begins its run to LaGuardia Airport from Broadway and 106th Street in Manhattan. Situated across from the bus’ rear door, the unit provides a handy place to store luggage, eliminating the need to leave bags in the aisle or stash them beneath seats. The racks (photo attached) will be installed on a total of ten buses during the pilot and those buses will be placed on the seven routes (M60, B15, Q3, Q10, Q33, Q48 and Q72) that serve the two New York City airports. I find this to be an interesting idea & wonder why it was not thought of or implemented earlier. So many people use other forms of non-public transportation to the airport & it is mainly due to the inability or desire to travel with a lot of luggage. Lets be honest, using public transportation with a good amount of luggage is not exactly an ideal or desirable trip for a traveler. I know many frequent travelers who if they do go to the airport by a way outside of using their own car, getting a ride, or taxi, will use privately run bus services since they provide room for luggage. This pilot program if successful could help get some of that lost revenue back to the MTA. While this won’t be a end all solution for many due to the lack of legitimate space for racks inside the buses, it sure should be able to provide a decent alternative. I hope to hear from anyone who gets to try out these racks. This is a fabulous idea, and we hope the left coast transit systems follow suit! For now, those of us who ride San Francisco’s Muni and BART systems have to share space with Samsonites and go toe-to-toe with Tumis.